Having come out with one of our favorite records from earlier this year (Paso’s Limited Perception), FINA Records are back just a couple months later with another phenomenal release! This time around, label owner Simon Morell has decided to combine forces of two Parisian powerhouses like some sort of mad scientist. 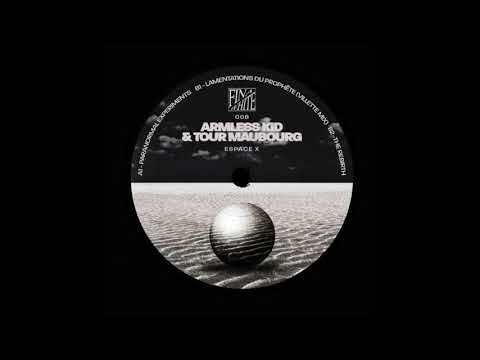 The Parisian powerhouses we speak of are none other than the promising lads Armless Kid and Tour-Maubourg, who have been at the forefront of the underground house scene with respective releases on Luke Solomon’s Classic Music Company and Folamour’s FHUO label. To be honest, we did not know what to expect when we heard the two were coming out with their Espace X EP. Both artists have stylistic tendencies that put them on opposite sides of the spectrum between no-nonsense house and jazz-tinged beats. Fortunately for everyone, this experiment seems to have worked. The EP consists of a total of three tracks – two of which feature both artists. However, our favorite original from the EP is a full-length track solely produced by Armless Kid. A balls-to-the-wall groover from beginning to end, “The Rebirth” is a certified DJ weapon that is guaranteed to energize any dancefloor where it’s played. Never allowing the upbeat nature of the tune to divulge into a heartless drone of 4/4 beats, Armless Kid does a stellar job of layering soulful vocals throughout the piece to give it “that extra morsel of quality” that comes to define each and every FINA release! To get your hands on a copy of Espace X, simply follow this link right here!